JUNIOR BALLETT FRANKFURT sucht Tänzer für die Produktion vom Ballett „Nussknacker“ Produktion. 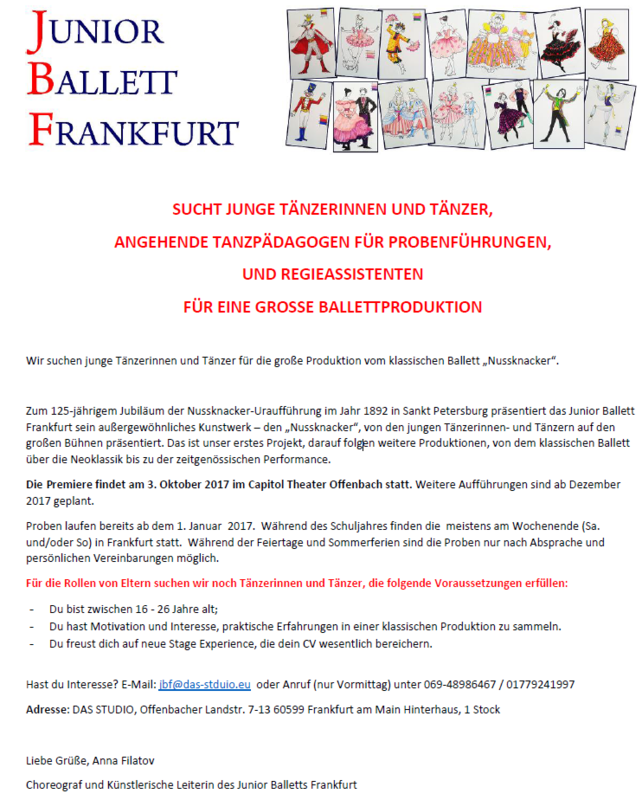 JUNIOR BALLETT FRANKFURT is looking for new dancers for the production of "Nutcracker" ballett. Call for dancers from Rhein-Main Region!!! Mostly inte resting for Rhein-Main Dancers! Travelling expenses or accommodation costs during audition, rehearsals and production cannot be reimbursed. Work permit in Germany is required. The audition will be by invitation. Junior Ballett Frankfurt is looking for 5 male and female dancers for a new production “Poem” coming in October 2018. 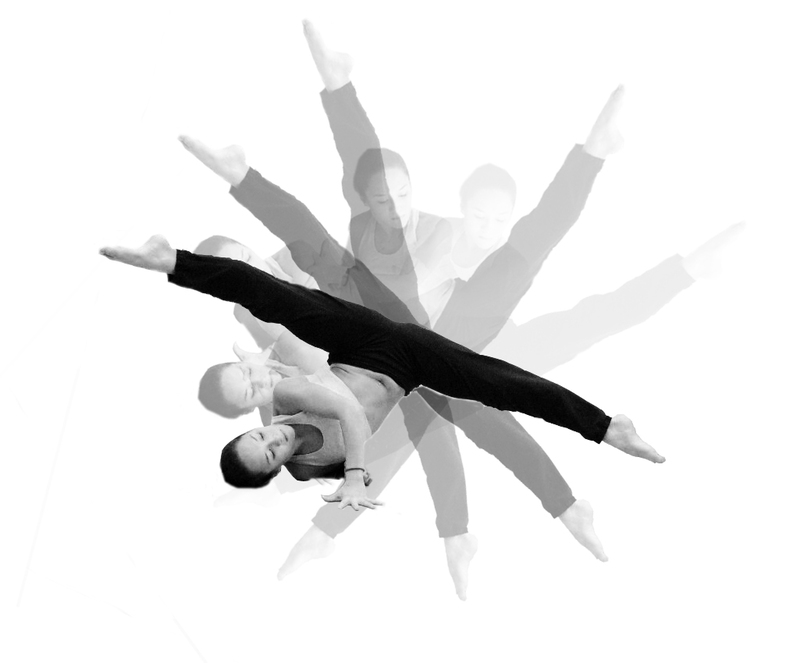 We are searching for: energized versatile dancers with strong contemporary dance technique and good classical base. Floor work and improvisation as well as partner work is required. Theatrical skills are a plus. Working with a kindness within a group is essential. How to apply: Please, send your CV, headshot and video to junior@ballettfrankfurt.com The audition will be by invitation. The audition is free of charge. Performances are paid. sucht Tänzer w/m für die große Produktion des klassischen Balletts „Nussknacker“. Zum 125-jährigem Jubiläum der Uraufführung vom Ballett „Der Nussknacker“ 1892 in Sankt Petersburg, schickt das Junior Ballett Frankfurt ihr Ballett als Botschafter in die Kunstwelt. Die Premiere ist am 3 Oktober 2017, im Capitol Theater Offenbach. Weitere Aufführungen sind ab Dezember 2017 geplant. Wir wollen eine weihnachtliche Tradition – „Der Nussknacker“ in Frankfurt einführen. are looking for strong male and female dancers to take part in „Nutcracker“ performance. – Mind. 3 Jahre Ballett Vorausbildung, mind. 2 x pro Woche in einer professionellen Ballettschule. Point Work ist ein muss. – Alter zwischen 12- 20 J. – Alter zwischen 16 – 26 J. – Motivation und Interesse, praktische Erfahrungen in einer klassischen Produktion zu sammeln. Du freust dich auf neue Stage Experience, die dein CV wesentlich bereichern. Haben Sie Interesse? Sounds interesting? JUNIOR BALLETT FRANKFURT sucht Tänzer für die Produktion vom Ballett „Nussknacker“ Produktion. 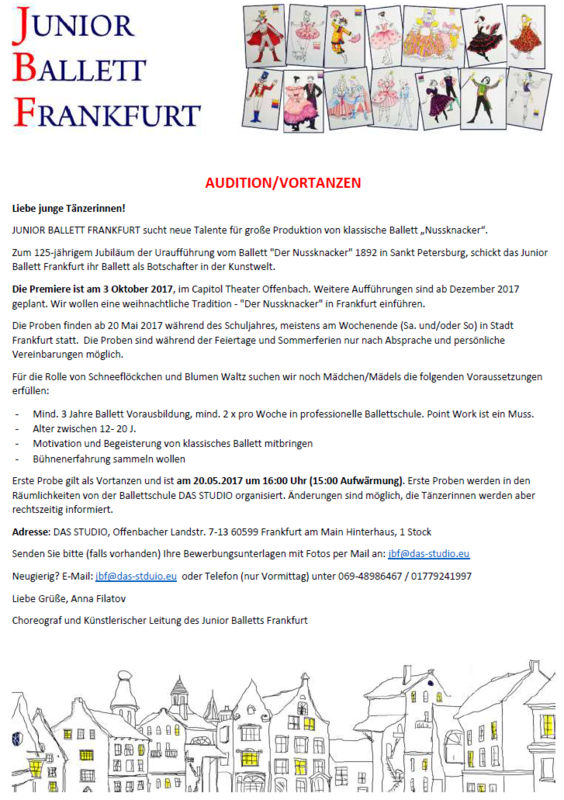 JUNIOR BALLETT FRANKFURT is looking for new dancers for the production of „Nutcracker“ ballett.